Turning on the water in your camper’s shower… only to have nothing come out. Now you’re naked, cold, and very sad. Buying an RV water pump is usually a spur-of-the-moment decision like this. You know, since it’s normally WORKING and you don’t need to think about it. But don’t buy one before you read this - there are some things you need to know. Note: Before you drop hard-earned cash on a new pump, make sure yours is actually beyond repair. Check out this guide to learn about RV water pump troubleshooting. 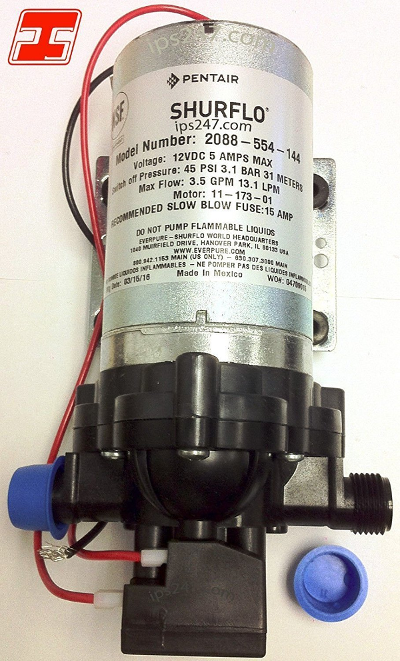 RV Water Pump Voltages: Which Do You Need? 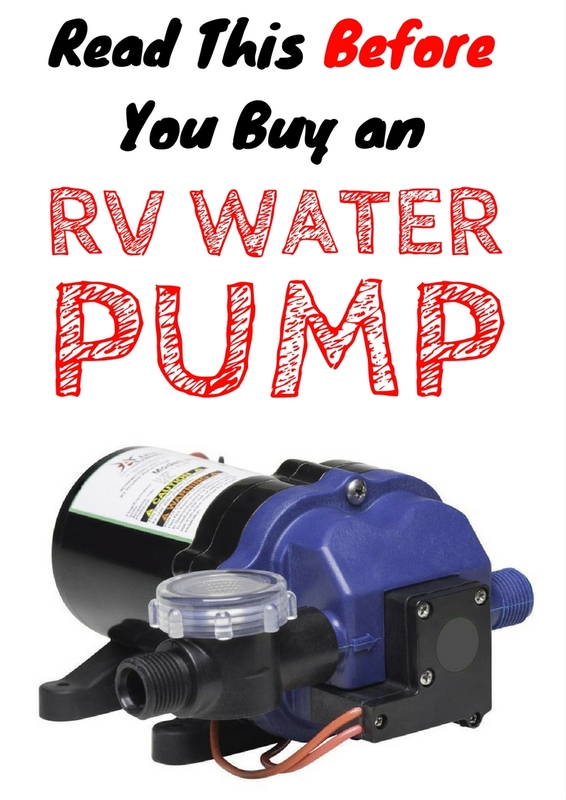 What Should You Look For When Buying a 12V RV Water Pump? 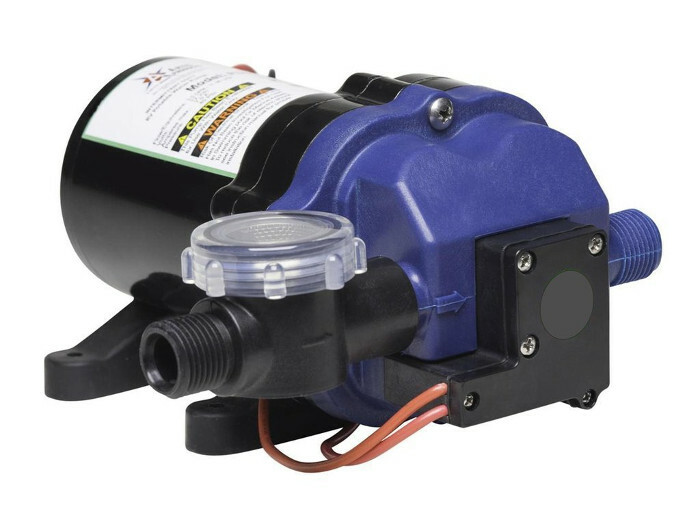 RV water pumps are always 12V - the higher voltage models are made for sticks and bricks (what us RVers call residential houses), and are far too strong for a camper water system. You can easily find this info on the label or on the website. First, check your RV manual for water specifications. If you don’t have it, either do a Google search of your model + manual (such as “Four Winds Chateau manual”) or call your manufacturer. How many gallons of water per minute is optimal for your rig? Second, check the dimensions of your current water pump. You don’t want to accidentally buy one that’s too big for the space you have. Side note: An RV fresh water pump shouldn’t be confused with a wastewater pump. This confused me when I was looking because some people placed both types on their guide, so I wanted to clarify for you. So which pump should you buy? You can find tons of pumps on Amazon, but these three got glowing reviews. They are really quiet RV water pumps with great build quality that should last you for years to come. At 12 Volts, 3.5 Gallons Per Minute, and 45 Psi, I can see why this SHURflo RV pump is rated the #1 RV water pump on Amazon. "Perfect replacement. Competitive price. Simply connected two wires and fit exactly with existing pipe fittings - literally a 10 minute job. Great water pressure and no adjustments needed." Just take note that it does run a bit loud thanks to the extra power, so you may want to add some foam cushioning or use a silencing kit to dampen the noise. If you’re looking for something a little more affordable, this pump by Arterra weighs in at 40 psi and 3 GPM. "I got this pump for my brother in law's RV his was out so needed a new on we both knew nothing about how to install or if it would even work. It was real easy to install did not even need extra parts just a little Teflon tape. This pump works better then then the one that came with the RV. Great pump for the price." Again, some users complain of it being loud. But others say it’s so quiet they can’t even hear it over the water. I think it depends on how well you install it and if you use a silencing kit. 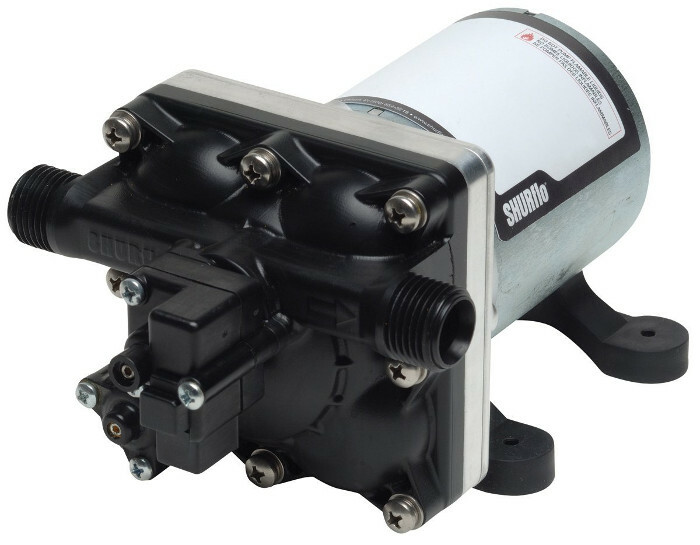 Another knockout by Shurflo, this pump has 3.0 GPM, 55 PSI, and 7.5 Amps. And it’s cheaper than the #1 pick. "I am a pretty normal nerd guy who is "getting handier" by the weekend. This was a super easy task to swap out my old low-end model of Shurflo that vibrated the hell out of my cheapo RV pipes. The fittings were the same as my old model (details below). Used the filter off of the old model, too, and got an opportunity to clean out the slivers of plastic (from the factory install of the freshwater tank?). Only "weird" thing I had to do was put the rubber feet in a different location, because the screws wouldn't grab and would strip out. So you know if that was the worst thing I had to do, it was easy. This new one runs much smoother. It's quieter at the pump, AND most of the plumbing is quieter because of it. It still vibrates the long run of tubing that goes from the kitchen area (where the pump is installed) about 8' over into the bathroom area. Probably have to get under there and zip tie them to something to cut down on the vibration even more; but this was easy money to spend to cut my embarrassing vibrations in half or better. Previous model was a 2 diaphragm unit 2088-422-144 that pretty much shook the floor and walls." The only thing bad about this pump is that a few people had trouble with them after only a few months. However, the manufacturer was good about replacing them. Once you’ve bought your pump and you’re ready to get to work, here’s a super helpful video by Rich from Trek With Us. He shows you how to replace your pump step by step. And that’s all there is to it - good luck on your adventures, and if you found this helpful, please share it with your fellow RVers! If you have any questions on which pump you should buy or how to install it, drop a comment down below and we'll get back to you.